"There was a lot of silence in the room," explains Lego’s senior art director Allan Jensen. "It was quite funny, I’ve never seen them like that." 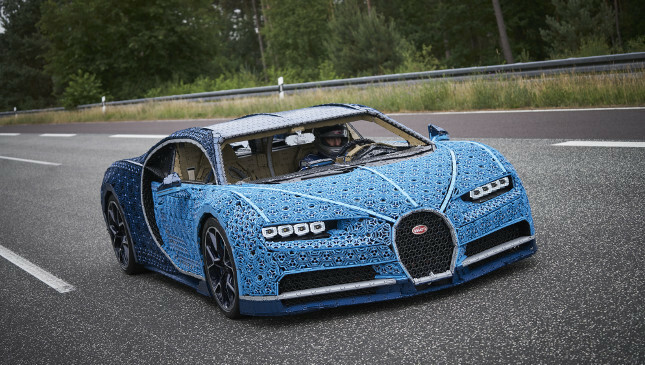 No surprise, really, considering the brick-shaped gauntlet thrown into the Lego Technic engineers’ briefing room back in June 2017: Build a Lego Bugatti Chiron. 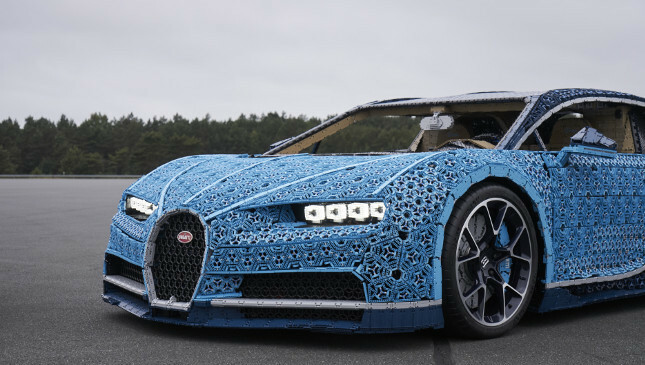 A full-size Lego Chiron. And make it move. It was only after project manager Lukás Horák and his team stopped laughing that they realized this was no joke. Then silence. "These projects, it always starts with laughing, and then the problems come." So here we are then: Just over a year of problems, 13,500 man hours and more than one million Technic bricks later, we’re staring at the most astonishing Lego project ever created. 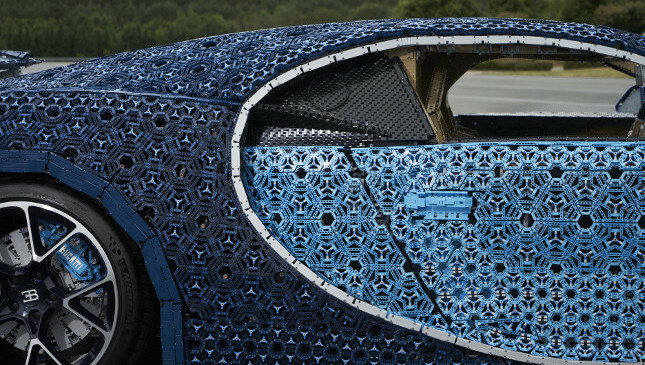 A full-size, 1.5-ton ode to Bugatti’s mind-bending Chiron. Though of course, the Lego wasn’t allowed to bend. 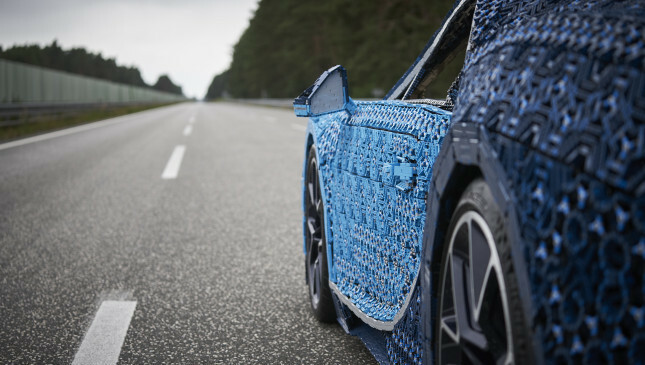 "We first started out exploring the limits of Lego Technic," explains design and build chief Lubor Zelinka. "The model builders spent a lot of time building various samples and then sitting on them. Maybe not the most scientific approach but it worked for us at the beginning," he laughs. Talk about a happy work-life balance. These layers of technic frames were then interlocked together with pins and beams to create a frame, and wrapped in Technic panels for extra sturdiness. This was laid over a steel frame; one of three ‘parts’ that aren’t actually Lego (the others being the real Chiron wheels and a steel roll cage). Then we come to the skin. 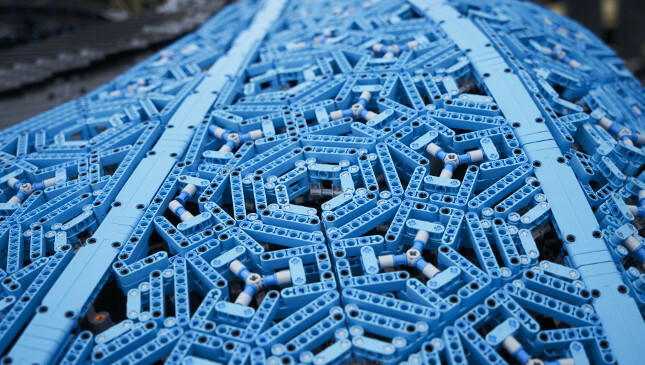 They invented a Lego 'fabric,' made up of small triangular elements connected together and attached to the frame via actuators. 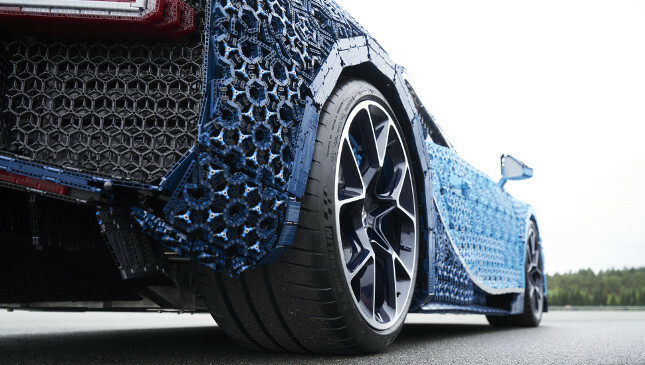 Move the actuator up or down, the triangle ‘fabric’ moves up or down, thus allowing the engineers to recreate the Chiron’s shape. Fun fact: Lego being Lego, the team had to build a tool out of Lego to adjust the other Lego. "In order to change the length of the actuator you have to spin the Technic axle, which is very labor intensive if you do it by hand," Lubor explains. "So naturally the first thing I did was grab a power drill." Turns out a power drill has quite a bit of torque. Too much. "So we built something out of Technic which has hardly any torque, but is perfect for this. It’s just a power function motor coupled to a small gearbox so you can change forward and reverse," Lubor said. 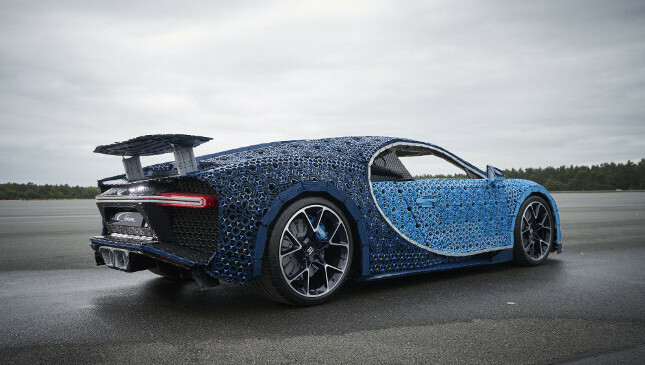 Drill sorted, the team then had to, y’know, shape the Technic skin into something resembling a Chiron. From… photographs. "Most of it was done from memory and from photographs," Lubor said, "because there’s no book for that. It was all done by sight." Also it’s probably a good thing to point out that they achieved this herculean feat without using any glue at all. Nada. 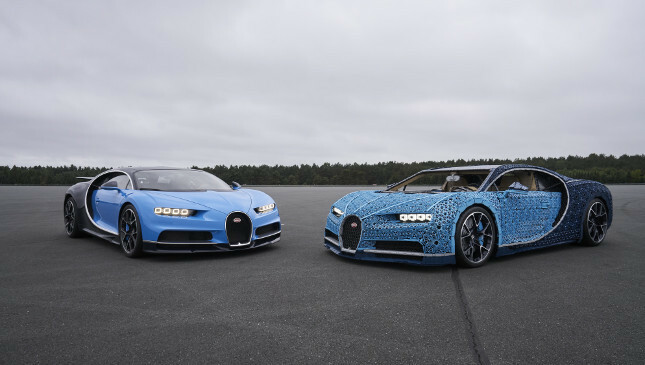 "They managed to create a freeform strategy to be able to replicate the surfaces of the Chiron," explains Bugatti’s director of design Achim Anscheidt. "It’s fascinating how well they captured this. It’s got a bit of automotive grunt, an almost aggressive presence." Pavel Volny, the electronics maestro, was given the task of making it move. "It wasn’t easy," he smirks. Inside sit 24 motor packs, with 96 Lego Power Functions motors per pack. 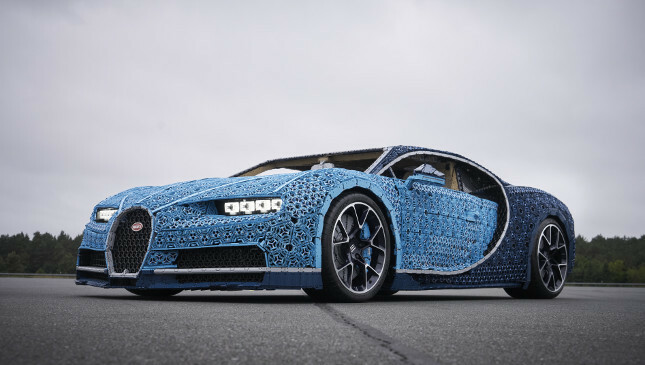 That’s… 2,304 motors in total, and each motor pack is made entirely out of Lego bits. Prepare yourself: this equates to a whopping 5.2hp, though 92Nm of torque. As much as a base Volkswagen Up. These are then connected by a steel chain to the main driving shaft, itself then connected to the rear axle. Yep, it’s a rear-wheel-drive Chiron. "We were thinking of four-wheel-drive," Lubor said, "but it’s kind of tricky, especially with the power function motors. "There was also the possibility of having an individual motor for each wheel, but that was even more tricky. 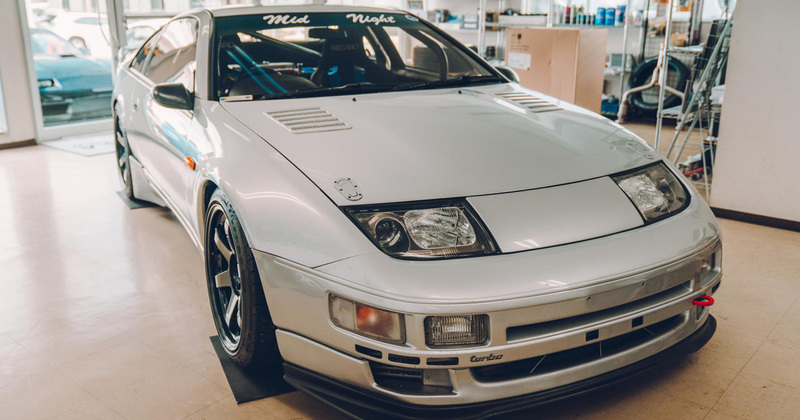 Then we thought about front-wheel-drive, but there’s not a lot of space in the front compartment, so we used the front for the batteries instead," he added. At one point during the model’s development, Lego considered using proper suspension: Springs and dampers. 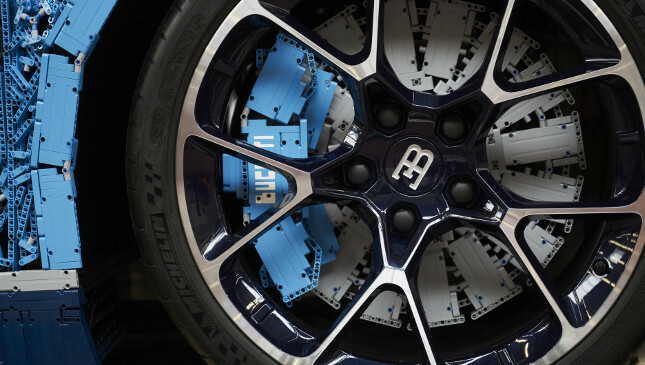 Enter Bugatti’s head of chassis development, Jachin Schwalbe, who quickly thwarted such notions. "They originally planned to put dampers, springs and proper suspension travel in," he said. "I advised them not to do it, because it would need a lot of space underneath. This was a big step for them." The other big step was actually moving the thing. Top speed? Theoretically, 29kph, though they haven’t got there yet. There’s no acceleration pedal: A pair of batteries power the motors, and you move forward via a potentiometer that determines the voltage levels. Brakes? There’s a pedal for those, and when you hit it the electromagnetic clutches on the rear axle disconnect. There’s even a fully functional rear spoiler, too. Oh yeah, did we mention that you can actually sit inside the thing? 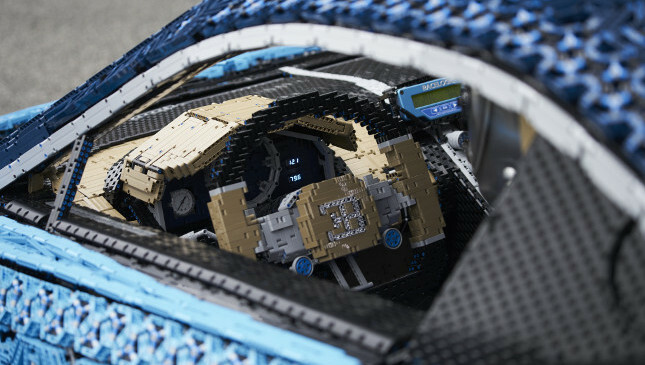 There’s space for two with seats made out of Lego, many buttons, indicator stalks, seat belts (real ones), a detachable steering wheel, interior lighting stripe and proper working doors with a closing mechanism made entirely of Technic bricks. "Lego is full of petrolheads," Lukas told us. 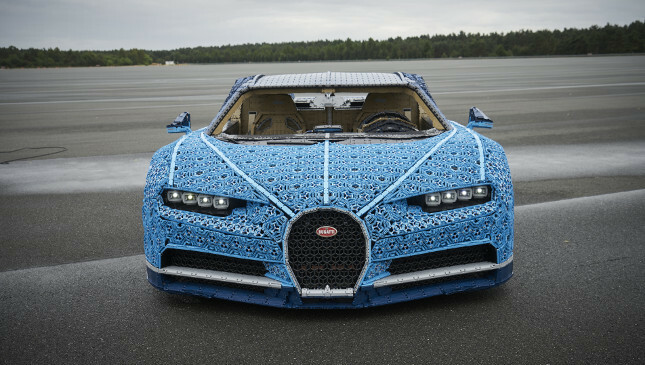 "As fans of cars, we were really amazed that we were even able to do a Bugatti. It’s a dream come true."